Running back Adrian Peterson is second in the NFL in rushing this season with 1,221 yards, 122 behind Philadelphia's LeSean McCoy. EDEN PRAIRIE, Minn. — Leslie Frazier shouldn’t have to have any difficult conversations with Adrian Peterson this week. Frazier held Peterson out of last week’s game with a sprained foot, even though Peterson wanted to play by the time Sunday’s game rolled around. Frazier classified his talk with Peterson as "not an easy conversation" but both sides expect Peterson to be ready this week. Peterson, who is officially listed as questionable, returned to practice and is expected to play barring any setbacks before Sunday. "If everything goes fine tomorrow, he should be ready to go on Sunday," Frazier said. Peterson said his foot is "feeling good" and didn’t have any question in his mind he’d be fine for Sunday at Cincinnati, which owns the league’s fifth-ranked run defense. "I’m looking forward to playing this week," Peterson said. "Get another day to rest tomorrow, which is going to be good. As far as the foot goes, I’ll be ready to go." Cornerback Xavier Rhodes will miss his second straight game with an ankle injury and he’s been unable to return to practice. Tight John Carlson, having concussion symptoms again after having passed the tests, is listed as doubtful. Matt Asiata is questionable with an ankle injury. Minnesota should get back Toby Gerhart (hamstring), right guard Brandon Fusco (knee), cornerback Chris Cook (knee) back for Sunday after they missed last week’s game. Gerhart, Fusco, Cook, safety Harrison Smith (toe), linebacker Larry Dean (knee), linebacker Chad Greenway (wrist), long snapper Cullen Loeffler (hand) and cornerback Marcus Sherels (shoulder) are all listed as probable after practicing fully on Friday. Peterson shared Friday why Frazier had such a tough time sitting his star running back out last week. Peterson sprained his foot the previous week against Baltimore and missed practice on Wednesday and Thursday, but returned Friday and expected to play Sunday. "Man, words can’t even express," Peterson said of his frustration with not playing. "I was hot. I was devastated. I was looking forward to playing and being out there with the guys. I didn’t get my way that day." Peterson had no say in the decision, which he said made it devastating because he felt he was ready to play. "My mind was ready to get out there and play," Peterson said. "I’m in game mode and then I find out that I’m not playing. No matter what I had to say, that’s what it was. That’s why it was tough. But fortunately we got a win, so that kind of ease the pain a little bit." Without Peterson and Gerhart, quarterback Matt Cassel threw for 382 yards in the 48-30 win, the most yards by a Vikings’ quarterback in a game since Brett Favre passed for 446 yards on Nov. 7, 2010. Asiata had 51 yards on 30 carries and three touchdowns last week in place of Peterson and Gerhart. "That’s one thing I was able to kind of take from the game, sitting back and watching those guys go to work and just seeing how productive we were able to be offensively, making a lot of plays in the pass game and then you can just add me to that as well, and Toby," Peterson said. "It will be a nice balance that you look for as an offense." 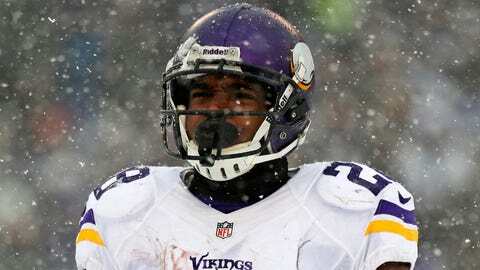 "Yeah, it’s not over 200 yards, so it’s still in play," Peterson said. No 2,000-yard rusher, as Peterson accomplished last season, has led the league in rushing the following season. Peterson said he wasn’t aware of the follow-up seasons after 2,000, but said he’s still trying to chase down another rushing title. "I look at it, any competitor would want to be at the top of the game," Peterson said. "I play this game to be the best. So with that, leading the league goes along. I’m just going to try to do what I can do, contribute to my team, focus on getting a win most importantly. And if I’m at the top when the season ends, that would be great." Getting healthy is one factor. Peterson was limited in Friday’s practice and he’s still dealing with a groin injury. "We didn’t have him do every rep, but enough where he would feel confident and we would feel confident," Frazier said. "So it was encouraging with some of the things he was able to do." Frazier and Peterson feel the groin injury has affected Peterson a bit this season and maybe limited his ability to explode for some longer runs. "It’s been affecting me, no doubt," Peterson said. "It’s kind of been a nagging injury, unfortunately, but I’ve been doing what I can to rest it up, strengthen it, just to maintain it through the end of the season."